This map includes place names for communities that you will find in old records. Some of these places have faded away over time. The only incorporated cities in McDuffie County are Thomson (the county seat) and Dearing. Below the map, you will find a link to a complete list of McDuffie Co place names with additional maps for those locations. These maps are quite interesting because they go from 1874 to the present. You can really see how the area has changed over time. You will also find a link to an 1865 map of Columbia Co which includes most of McDuffie (McDuffie Co was formed in 1870 from Columbia and Warren Cos). One important note: Some of the place names have changed over time. For example, Dearing actually had two names at the same time; the Rail Depot was Dearing and the Post Office was Lombardy. Boneville was also called Bell at one time. Headstall was alternately known as Tuther. Clifford was once called Republican. In addition, the county was divided into 5 Militia Districts and often people referred to which district they lived in. The Districts were Thomson District (District #134, which included the Boneville area), Mt. Auburn (#152), Wrightsboro (#274), Republican District (#132), and Dearing District #133). Each of these districts elected a Justice of the Peace to hold civil court, a Notary and a Constable. The census records list names using these districts. I would like to extend my thanks to James Malone of Dearing for creating this very useful map. 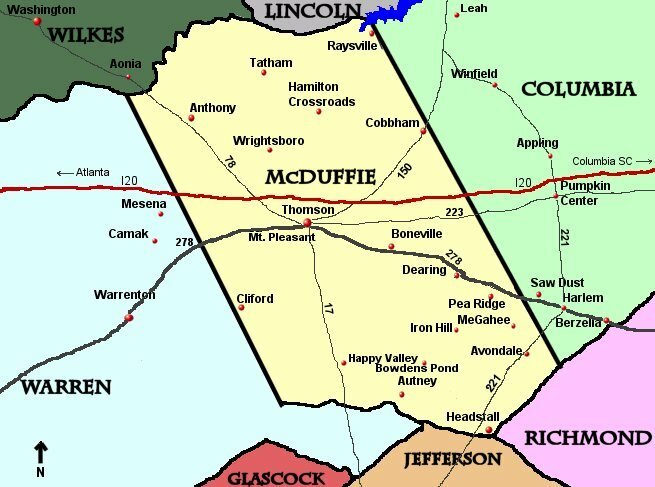 Historic McDuffie County Place Names with some additional maps.